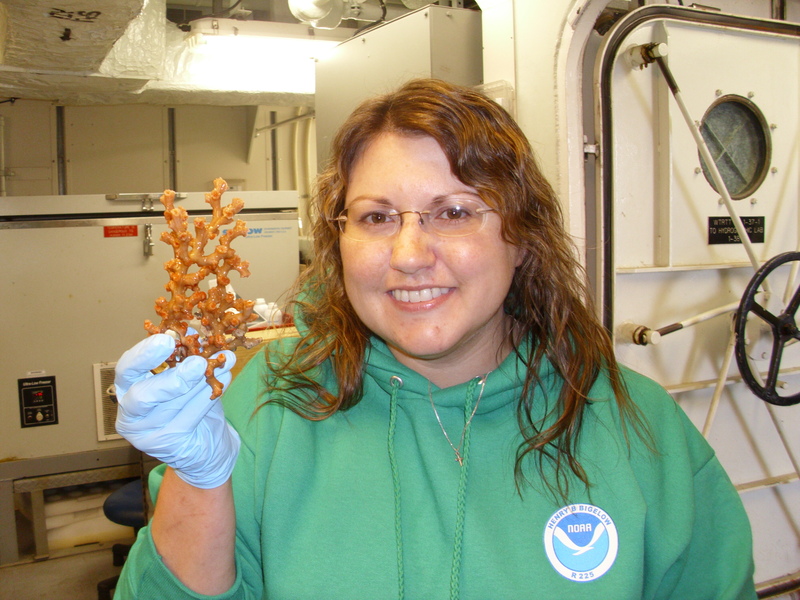 On a research vessel such as NOAA Ship Henry B. Bigelow, does the ship support the science? Or are the ship’s activities separate from those of the Science Crew? 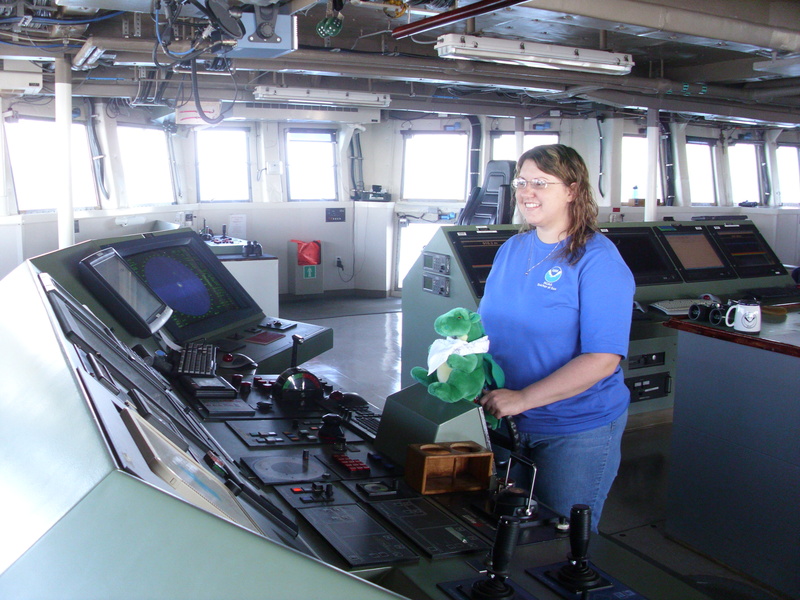 I didn’t realize how much the Ship’s Crew and the Science Crew worked hand-in-hand until I toured the Bridge. First off, the ship is what’s known as an FSV. What does FSV stand for? FSV stands for Fisheries Survey Vessel. The primary responsibility of the Henry B. Bigelow is to study and monitor the marine fisheries stocks throughout New England (the Northeastern section of the United States). There are many scientific instruments aboard the Henry B. Bigelow that allow crew members and visiting science teams to do this and other work. 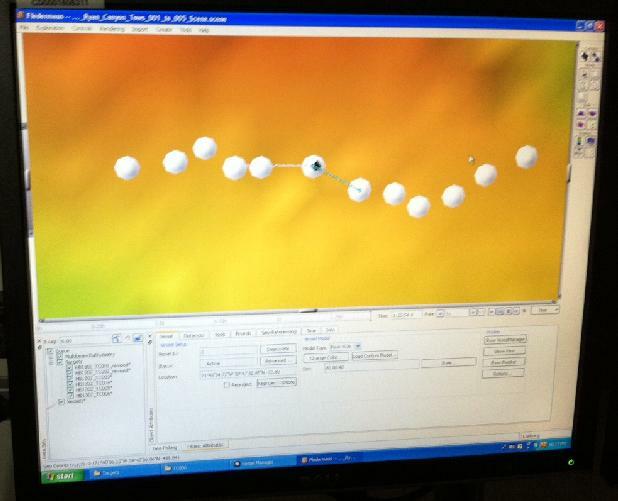 The ship has multiple labs that can be used for many purposes. The acoustics lab has many computers and can be used for modeling data collected from multibeam sonar equipment. The chemistry lab is equipped with plentiful workspace, an eyewash, emergency shower, and fume hood. Our TowCam operations are being run from the dry lab. This space has nine computers displaying multiple data sets. We have occupied the counter space with an additional eight personal laptops; all used for different purposes such as examining TowCam images or inputting habitat data. The wet lab is where the collection sorting, and filtering take place. It is used during fisheries expeditions to process and examine groundfish. During our research expedition, the wet lab is used mostly for staging TowCam operations. We also process sediment and water samples that were collected from the seafloor. Sediment is collected using a vacuum-like apparatus called a slurp pump; water is collected in a Niskin bottle. The sediment is sieved and any animals are saved for later examination. Water samples are also filtered there, to remove particulate matter that will be used to determine the amount of food in the water column. Walking around the ship, I noticed a psychrometer set, which is used to monitor relative humidity, or moisture content in the air. There is also a fluorometer, which measures light emitted from chlorophyll in photosynthetic organisms like algae or phytoplankton. The CTD system measures physical properties of the ocean water including conductivity/salinity, temperature, and depth. Additionally, the ship has a thermosalinograph (therm = heat, salin = salt, graph = write). Saltwater is taken into the ship and directed toward this instrument, which records the sea surface salinity and sea surface temperature. 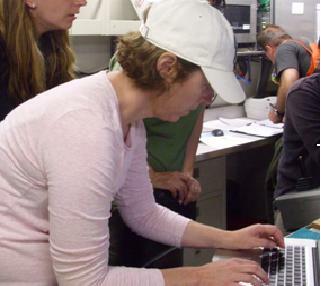 The crew of the Henry B. Bigelow not only supports the research efforts of the science team but is also actively involved in conducting scientific research. Their instrumentation, knowledge, and team work enable them to protect and monitor the western North Atlantic waters and its living marine resources. Dewey the Dragon is plotting the course. Dewey the Dragon, all the way from Crest Middle School, enjoyed getting a tour of the Bridge. 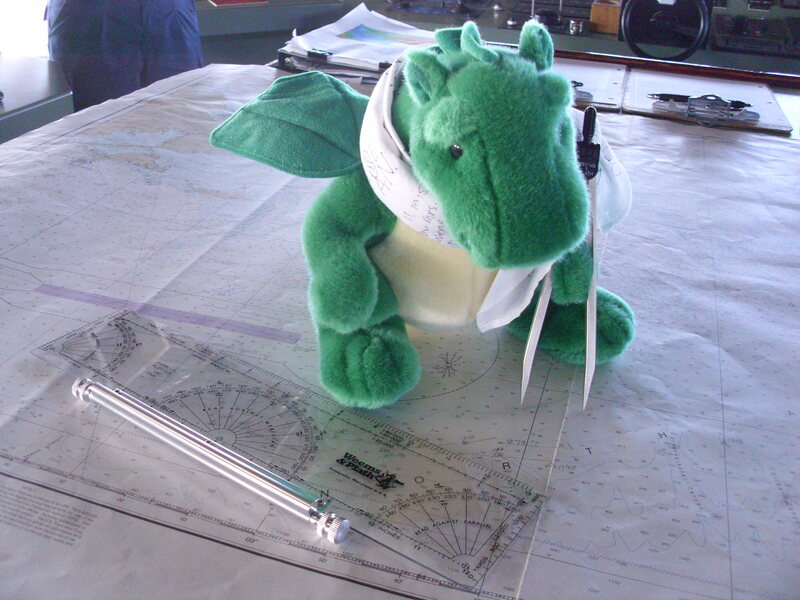 Dewey the Dragon learned how to steer the ship, read charts, and monitor activity using devices such as the alidade. Thanks to Ensigns Katie Doster and Aras Zygas for showing us around. The alidade is a device that allows people on the ship to sight far away objects, such as land. The person on the ship spots three separate points on land uses these sighting to determine the location of the ship. Alidades can also be used as a tool when making and verifying maritime charts. I have been amazed in watching the Science Crew (scientists and TowCam engineers) operate this week. With any challenge that is presented, they work as a team to make minor adjustments, troubleshoot, and correct any issues that may arise. That got me thinking…what skills or characteristics are important in becoming an engineer or a scientist? Be an excellent student. Learn to think independently. Volunteer or become familiar with resources, like labs, museums, or other scientific institutions. 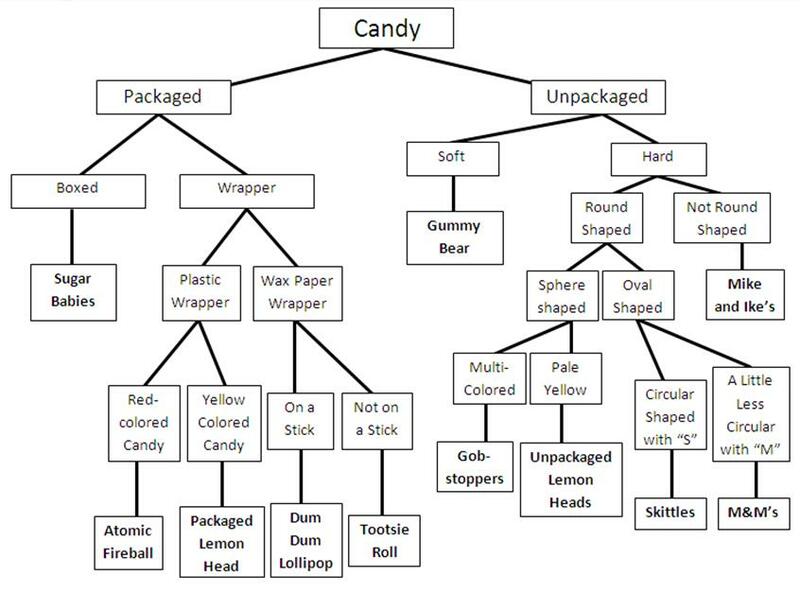 Develop computer skills or computer programming skills. Perseverance: If you make a mistake you can’t get down about it. You have to pick yourself up and try again. Curiosity: If you are curious, you’ll be passionate about what you’re studying, and will be able to communicate that to others. If you’re passionate, you will persevere and work through the challenges. 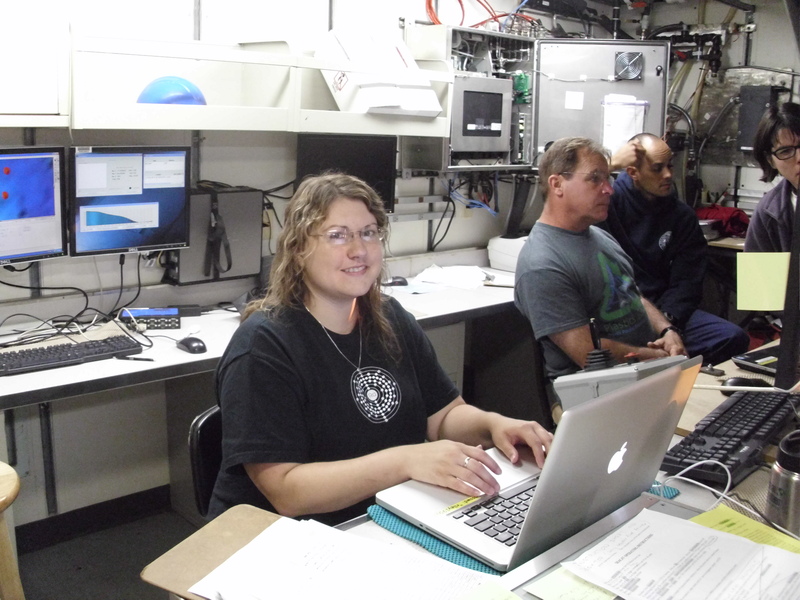 During my Teacher at Sea experience, I have had the opportunity to observe the Science Crew during many different activities. Below are some skills or characteristics that I have seen exhibited by the scientists and engineers involved in this research expedition. Cooperate: Get along with others. Be tenacious and persevere; be steadfast, never give up. Listen to and respect other people’s ideas. Think things through before jumping in. 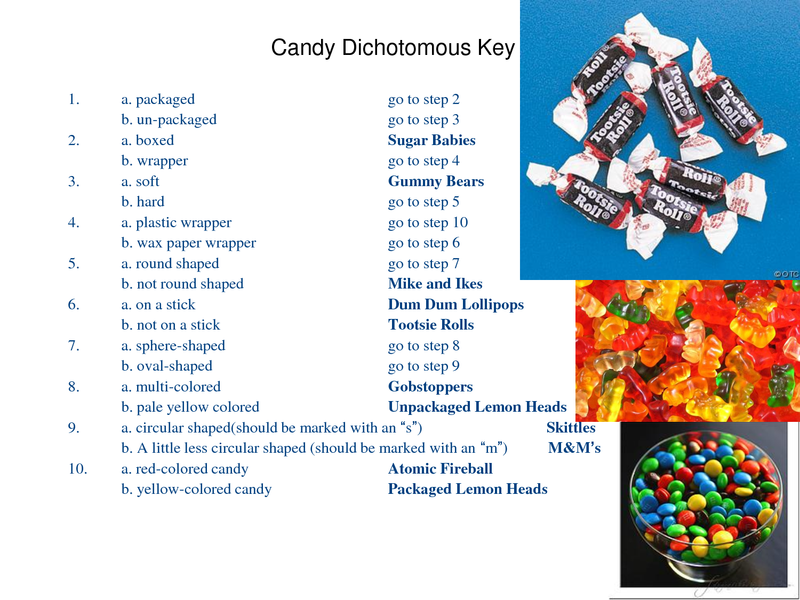 Come up with hypotheses or solutions and test them. If the solution doesn’t work, try another one. As science teachers, we try to instill these traits in our students in the classroom. Whether it is completing a group project, conducting a lab, or taking notes, there is always opportunity to improve our science and engineering skills. One feature of the deep ocean is that this region of ocean is subject to very high pressure due to the tremendous weight of the water above. So, how about a demonstration? Take one Styrofoam cup, decorate it, and send it over a mile deep in the ocean. What happens to the Styrofoam cup? 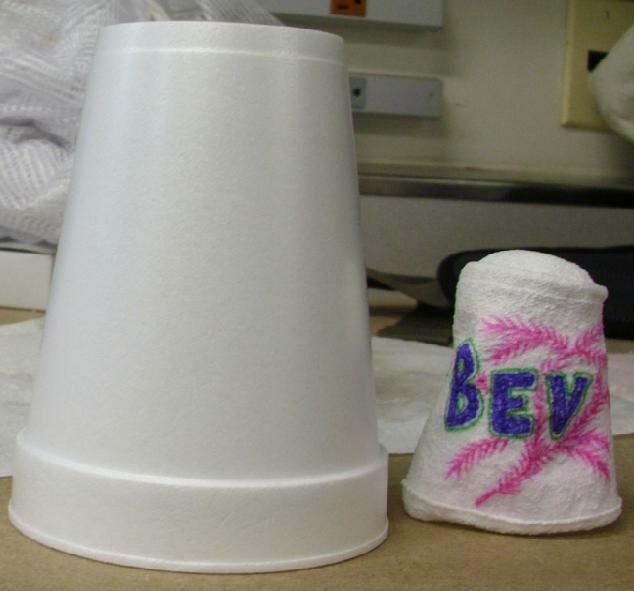 Increased pressure at the bottom of the ocean caused the Styrofoam cup to shrink. This is the misconception that some people had, when I told them initially that I would be participating as a NOAA Teacher at Sea. On a vacation cruise and a research cruise, participants stay an extended period of time on the ocean, and they receive three meals a day. That is pretty much the end of the similarities between these types of cruises. During a scientific research expedition, there is a mission to accomplish. For example, this trip is examining sites that are known or predicted to be deep-sea coral and sponge habitats. 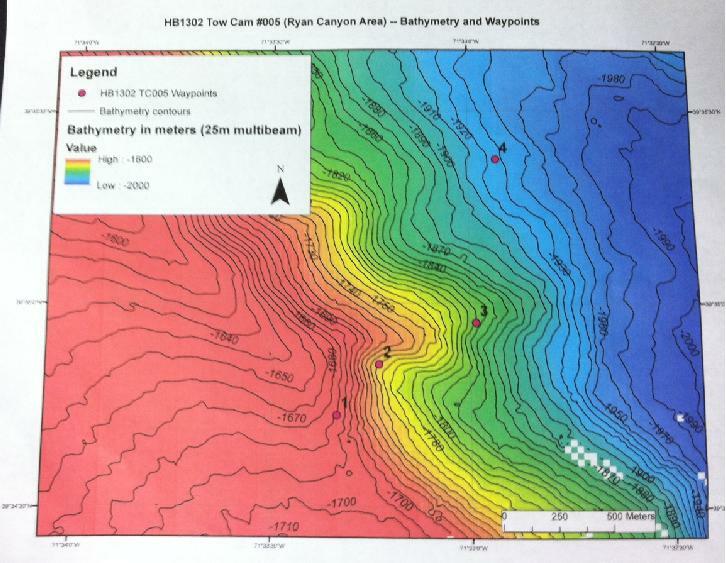 Many multibeam bathymetric maps are consulted to find the most suitable sites to investigate. Bathymetric maps are similar to topographic maps with the exception that bathymetry applies to the topography of the ocean floor. 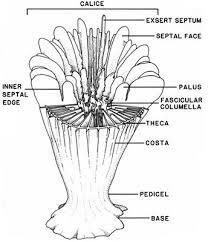 Most of the major structure-forming deep-sea corals are found on hard substrate. 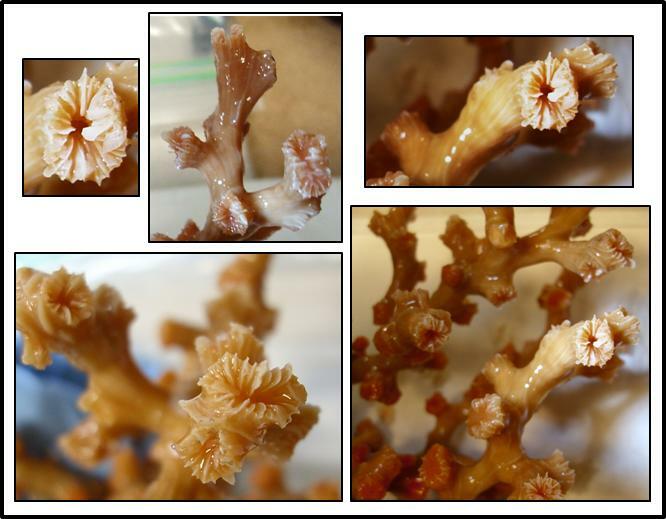 Thus, areas of soft sediment are not the most likely places to find the majority of coral species, however many other organisms like brittle stars and anemones, may be found there. There is a lot of preparation that goes into planning and coordinating a research “cruise.” The Chief Scientist must put in a request for a research vessel, and must assemble a science crew that has the skills and research interests that align with the research mission. In the months leading up to the research trip, the science party will discuss specific science objectives, protocols and potential study sites. Every participant must receive medical clearance, which includes having a TB (tuberculosis) test, and a recent tetanus vaccination. 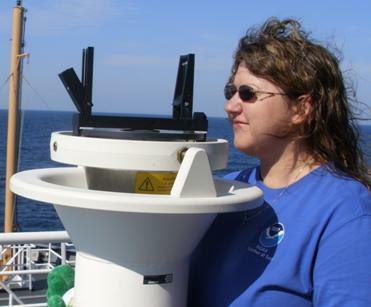 The Chief Scientist, with input from the science team, determines which areas of the ocean to examine, and what type of technology to use to explore the ocean. Weather and waves may prevent some of the “dives” from taking place. Safety first – the conditions must be safe enough for the TowCam operators and deck crew to be outside during deployment as they lower TowCam safely into the ocean. This bathymetric map displays the topography of the ocean floor. During TowCam deployments, many things must be done to make the dive successful. The Chief Scientist selects several points (waypoints) along a survey line within a canyon. These points help guide the ship during the TowCam deployment. To get TowCam into the water requires a lot of communication and coordination of efforts. The winch operator and deck crew are responsible for getting TowCam into the water. The winch operator is in constant contact with the TowCam pilot and controls the wire that lowers TowCam into the water. At a certain depth, the control is passed to the TowCam pilot in the lab who uses a joystick to lower the camera to the ocean floor. The pilot and the Bridge are in constant communication during the dive. The Bridge controls the ship and follows the track for the survey. The TowCam pilot analyzes data displayed on several computer monitors in order to make the most informed decisions as they guide the camera through the water column by moving TowCam and up and down in the water column. In addition, a variety of data are collected during the deployment. I have been logging data during the night shift deployments. I help keep track of variables such as depth, winch wire tension, latitude, longitude, and altimeter readings along the survey track. All this information will be invaluable to scientists examining the data collected during this research cruise. At Crest Middle School, we try to teach our students critical thinking skills: think for themselves, make informed decisions, gather data, predict, and draw conclusions. This research trip is a prime example of how skills that students acquire in school will be beneficial for them in the future. When completing a task such as logging data, I have to decide what the important events are that have occurred in the TowCam dive, and to phrase those items in a way that others will understand. TowCam is about the size of a refrigerator. It has one large high-resolution camera that takes pictures every 10 seconds. It also has a CTD, which records conductivity (salinity), temperature, and depth. TowCam also carries several Niskin bottles, used for water collection at depth and a slurp pump that pulls sediment from the ocean floor into a container for later analyses. Getting ready! I’ll be headed to Rhode Island, and leaving on the NOAA ship Henry B. Bigelow very soon. Today, I showed my 8th grade students a picture of the ship and told them about the research that would be taking place. I brought a bandana to school and asked all of the my students to sign it. 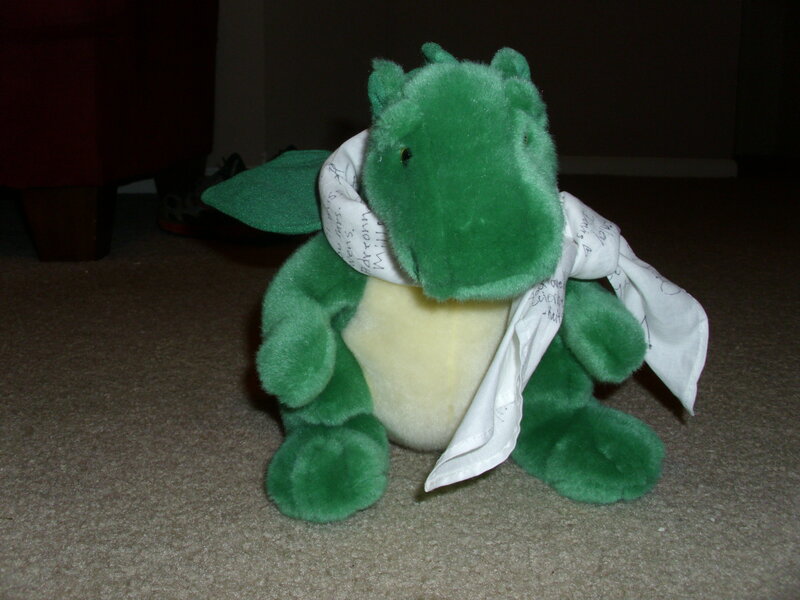 Our school’s mascot is a dragon, so I will be bringing Dewey the Dragon along with me on my Teacher at Sea trip. Dewey will be wearing the bandana my students signed (as seen in the photo). I will be taking pictures of Dewey during the trip, so that students will be able to see him in the lab, and will provide some idea of scale in many pictures. I am looking forward to this research experience, and am excited about the opportunity to share this information with my students, school, family, and local community. What an exciting adventure awaits!